Gather information• Employer identification number. Filers cannot use their Social Security number. Anyone who doesn’t already have an EIN can apply online. It takes the IRS about two weeks to establish a new EIN. Taxpayers should use the same name on their Form 2290 as was assigned to them with their EIN. The name control on Form 2290 must match the EIN. • Vehicle Identification Number of each vehicle. • Taxable gross weight of each vehicle. File• E-file. The IRS encourages all taxpayers to file electronically for faster processing. 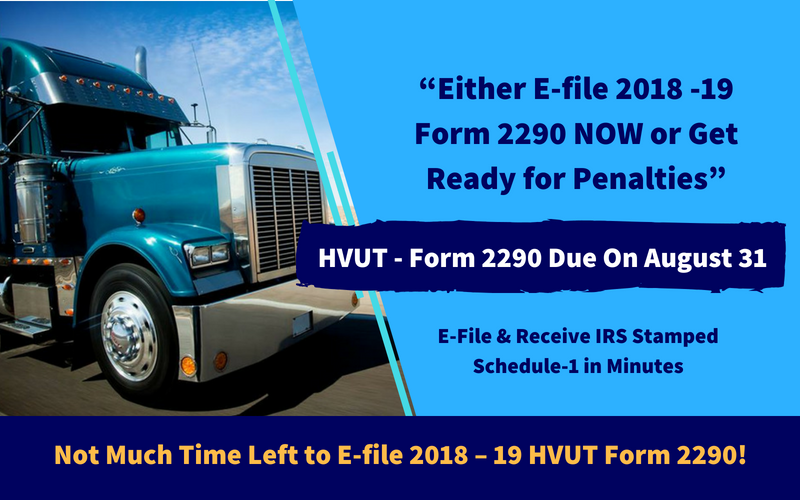 Taxpayers are required to file electronically if they are reporting 25 or more vehicles on Form 2290. When using e-file, taxpayers can receive a watermarked Schedule 1 within minutes. • Complete and mail Form 2290. Filers can go to the Form 2290 Instructions for the correct mailing address. Taxpayers can expect to receive their stamped Schedule 1 within six weeks after the IRS receives their Form 2290. Pay• Pay taxes by credit or debit card. Filers can pay by internet, phone, or mobile device. • Electronic funds withdrawal. Filers can authorize a direct debit as part of the e-file process. • Electronic Federal Tax Payment System. This requires advanced enrollment.